Starting August 31 I'm going to be taking a break from social media. 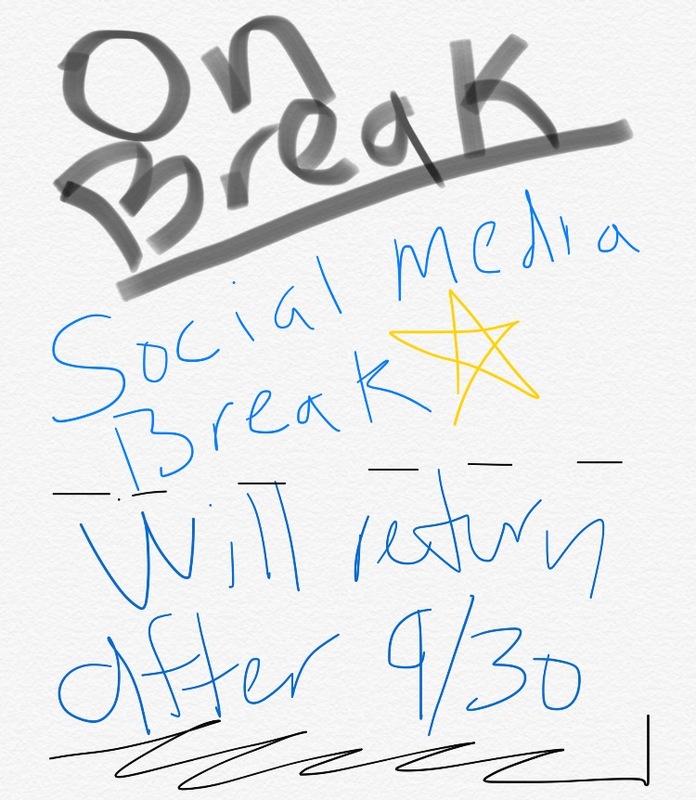 It will be a break from all forms of social media. In other words, "I'm going dark." Now in our world a person may ask something like this, "Neal why would you do that and what value would it bring?" It's a great question and I appreciate it. This isn't a flippant decision to go dark. This is something I've thought about for the last couple months. It's something I've been wanting to do since June but didn't feel the timing was right. It's also something I've done in the past almost as a reset button. It's something to help me reset how I spend my time and what I focus on. My desire is for Christ to be the center of my life. Please don't hear me to be saying that Christ is not the center of my life right now. Christ is very much the center of my life but I need to make sure He gets to reign properly. When I spend time on social media it can detract from my time with Christ. It cane take away my focus and I want to get reentered. This summer has been a busy one. We've been on lots of adventures, had speaking engagements, pre-marital counseling, weddings, family trips, staff hires and I've had my own fair share of challenges. When life gets crazy a person can choose to do one of two things: they can run to Christ or slowly drift away from Christ. I've found to stay close to Christ and I feel this decision is going to help strengthen my walk with my Savior. Someone once told me that people spend up to 8 hours a day on social media. My conservative guess, for my life, is that I spend about 1 hour and 15 mins a day on social media. I do find myself checking it more often on some days than others. When I think about the time I spend on social media in a day and add it up, it becomes about 9 hours a week. To put it in perspective: that is a work day for most people. My hope is to recapture my time and invest it in areas that I long to invest in. This could mean spending my time to read the stack of books on my desk (or the ones I keep carrying in my backpack and never read). It might mean calling more friends and seeing how they are doing or texting an old friend to catch up. I may take some time to watch more movies with my wife (once the kids are in bed, of course). Maybe it means a new hike with the family this weekend. What I'm getting at here is that I want to be in control of my time and I find that social media beckons me to scroll and I miss out on what is front of me. The last couple nights I've been conscious of my social media tendencies. I find that around 7:15pm I hit a wall with my energy and "check out" on my family. Its a bad pattern. Its a horrible thing to admit. In fact, tonight, Sophie said; "Daddy, put that away!" It was a reality check. I want to engage with my kids more. Sophie is only going to be 8 for a year. Leah is on the second half of 6. Isaiah is learning new things every day. And I want to be fully engaged in these moments. I want to spend as much time with my family as possible. I don't want to be checking social media when I'm on a date with my wife; I want to be fully engaged. I invite you to join along with me or to allow my thoughts to help you shape a time when you could take a break from social media. Also, please share your thoughts in the comments section so others can hear from you. *there are a couple of times where I will need to get on Facebook for a brief moment to help promote/invite you to great things happening at Central Peninsula Church.